Tradescantia (also known by the common name spiderwort) is one of the foundation plants in my garden. By this I mean that I grow a number of different varieties of this plant and I grow them in many different parts of the garden. 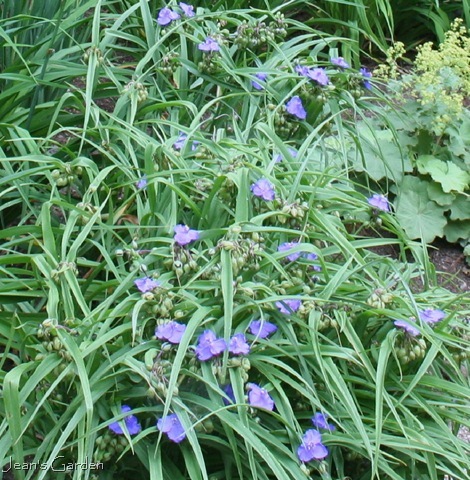 Reference works usually describe tradescantia plants as flowering in spring and early summer and then going dormant, although they can be cut back and they will flower again in fall. The descriptions usually also say that the flowers close up “by mid-day.” Because both of these characteristics seem to be responses to heat, it is not surprising that the plants behave somewhat differently in my cool Maine garden. My tradescantias usually begin blooming in mid-late May; and although they may slow down some in late summer, they often bloom continuously until frost. Similarly, in my garden, the flowers often stay open until mid-afternoon; and on cool, overcast days or in the cool fall air, they may not close up at all. I’ve also found descriptions of tradescantia as needing very moist conditions or part shade not to be true in my cool climate; they thrive in my sandy soil, attaining heights of 2 1/2’ – 3’, and they grow happily in full sun as well as in part shade. Tradescantia seem to be more often associated with the south, where they are particularly likely to grow as wildflowers. But I think they are wonderful plants for cool-climate gardens. The hybrid varieties are rated as cold hardy to USDA zone 3, and the length of both the bloom day and the bloom season are likely to be extended in more northern gardens. I love these plants, and I wouldn’t be without them. It was a nice thought, to stop by and visit you, Jean. I had hoped to be able to, but now we’re going home by way of the coast, leaving Fri. morning and heading to Rockland, where my husband grew up. From there, we’ll head home. I know I would enjoy seeing your garden ‘in person’! I have been struck by the gardens I’ve seen in Maine–everything is thriving so well in the damper, cooler weather. People here may not think it’s damp or cool…even with 80+ temps on and off. But it is–in comparison to what it’s like in VA with our 80+ temps. There’s no comparison. Actually, we’ve been having 90+ and 100’s for the past several wks. Miserable. I don’t want to go back home! I’m glad to have brief internet reception. It’s sad how much I’ve come to depend on it…even on vacation!! But we aren’t getting it often so I’m not ‘too’ distracted by it! Even if I can’t visit, I have a very good idea of your climate and how well things do in your garden. It may be for a ‘shorter’ time period, but many plants might be more prolific because of Maine’s more mild temps. Jan, I had never heard of Bowerbank before; I had to get out my Maine Atlas and look it up! I hope you had a great visit in Rockland on your way back to the steam heat of Virginia. I wouldn’t expect tradescantia to behave in your Virginia garden the way it does in my Maine garden. I would expect it to go dormant in your garden as soon as the weather really heats up and then, if you cut it back, to return for an encore performance in fall. I wonder if it is also slower to form big clumps in warmer climates. I planted a division of this in my Gettysburg garden (similar to your conditions in Virginia), and it hasn’t grown by leaps and bounds there the way it does in Maine. Dear Jean, Tradescantia are, as you so rightly point out, such garden stalwarts requiring little in the way of specialist treatment and rewarding with a long flowering period. I was interested to read that yours continue to flourish in the height of summer for I have always associated them with late spring/early summer [indeed May, as you write]. I too grow T. ‘Osprey’ and find that teamed with the palest of pale blues, T. ‘J.C. Weguelin’, it positively glows in the evening. oh boy I like these! I’ve never seen them before but I’ll be looking for them now. These are beautiful! I’m afraid they would have been dormant long ago in my garden. It’s fun to see what grows farther north. My first Tradescantia was a purchase in a one inch pot. It was quite a disappointment because there were never enough buds on the plant to maintain sustained blooming. By year two I started to admire it and by year three the plant performed exactly as you described. Here in Montreal, it grows in part shade as well as full sun and I too find it in bloom in late autumn. I particularly enjoy varieties with dark purplish-blue petals. This is one of a handful of perennials that produce such intense blue coloration. And that is precisely why I value it and overlook its occasional messiness. Edith, It’s nice to have your voice back in the blogosphere! I haven’t seen ‘J.C. Weguelin’ and will have to look for it. I’m interested in your comment about the way your tradescantia glow in the evening; even here in Maine, it is seldom cool enough for them to stay open into the evening. Marguerite, I love your enthusiasm about the new plants you are discovering in your new region. I imagine that these would work well in your conditions. Deb, It is fun to see what grows in other regions. Whenever I see something I can’t have because they are not cold-hardy here (like agapanthus and blue lace-cap hydrangea), I remind myself of all the flowers I love that thrive in my cool climate. Allan, Thanks for confirming my experience with these plants. I always think of Montreal climate and growing conditions as pretty similar to mine. It’s one of the reasons I love to visit the Montreal Botanical Gardens; I figure if I fall in love with something growing there, I can grow it at home. Tradescantia would fade away in my garden, too. Also, for some reason Tradescantia always leaves me cold. I don’t know why. Noelle, I love the fuzzy centers, too, especially on a flower like Osprey where the fuzzy blue is set off against the white of the petals. Susan, Your response is one of the reasons I think books that identify the dozen (or fifty or whatever number) plants that everyone should grow are misguided. Gardens are about the way that plants interact with the environment, the gardener, and the viewer. Something that seems sublime to one gardener can leave another cold. It’s the limitless possibilities created by these interactions of humans, environment, and plants that give our gardens their individual personalities. 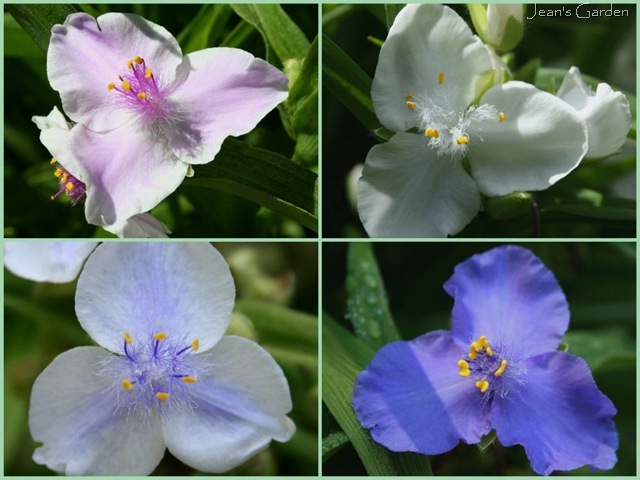 Where can we order specific cultivars of tradescantia, e.g., T. “osprey” and T. “J.C. Weguelin”? I have one tradescantia in my yard, but, alas, I don’t remember the variety. Does the wildflower form have smaller flowers than the garden plants? Thanks for visiting Kittye. I’ve noticed that many of the older varieties of Tradescantia are hard to find in nurseries. I think your best bet for finding specific varieties is to search online. According to Rodale’s Illustrated Encyclopedia of Perennials, the hybrid varieties do tend to have larger flowers than the wild species plants. This pretty little plant just takes over in my South Carolina beds. And if left to develop is very hard to dig up. I tolerate a bit of it here and there. I have been growing Tradescantia Virgiana for the past 20 years. Mine are all shades of purple and blue. (Some of my purples are so light they look almost white.). There are actually some white spiderwort. and about 6 years ago I got some of the red and it has never been as delightful as the other colors. My red is very scruffy looking soon after the flower pods bloom and that takes about 6 days. It is very invasive. it stays short, 12″ maybe. I have not shared it with friends unless begged. 6-8 flower pods on the shoots that will last as long as a week and a half. A handful of these shoots makes for quite the inside “flower show”. About 12 days, but the shoots get a good start at rooting (with a little care) and finally the flower pods drop their little grey beetle-like seeds. All of which will produce more plants. How cool is that. Most of my larger patches of Spiderwort are growing on and around the west-southwest side of my house which is on the side of a small lake in the Finger Lakes region of NYS. But I place my over flow wherever I can find a space until I find someone who Would enjoy some. Most of my patches have some shade during their day. To use For an “inside flower show” or the shoots begin to look kind of scruffy after flowering. Then they begin to branch out and stay looking strong and healthy with flowers from early spring Til frost and the patch may grow a little thicker faster. it spreads by seed, cuttings, division and the root systems push up new sprouts a bit Like daylilies just not as invasive as the wild lillies…..
:They are easy to transplant; digging up a whole patch and placing it in a new location. and If a few new sprouts reappear in the old spot they are easily plucked out and moved. the roots stay pretty much within the first 10″ of soil. My plants are in fairly good soil. if it is too hot(90s and dry for more than 3 or 4 days), I water. And up until the last 4 years I used buckwheat hulls as mulch. 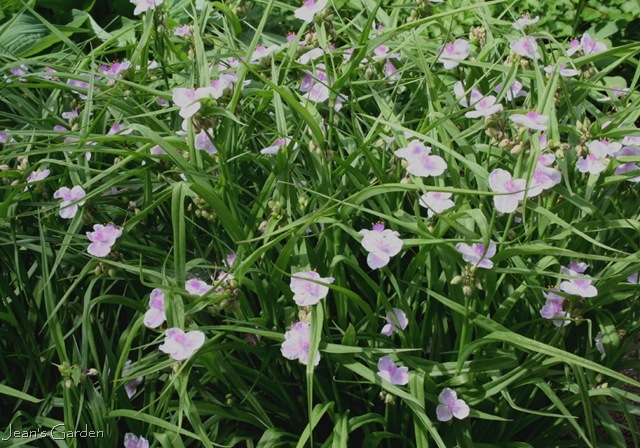 On Lake Dr in Inman Park I encountered 3.5′-4′ high Spiderwort similar to my variety and some of their Stalks were bigger around than my thumb. There were probably as many as 20-25 flower pods on a stalk. This trip August 2013 there is a plant just down the street in Little 5 Points that is the size of my cuttings with a years growth. what makes the difference in the Atlanta plants is probably the amount of shade, age, water(although there’s been a good amount of precipitation this month). I certainly don’t have all the answers or the Latin names, but I definitely love my Spiderwort. FYI there is a sap the flowers release easily cleaned up on most surfaces. I have lead to believe that this sap is uses in the dying of fabric for kimonos. Interesting trivia. We bought a house last May, although did not fully move in until October. I did however plant flowers like crazy in the beds along the front of the house and all along the border of the back yard. We had a horrible winter and I thought I lost a lot of things. It’s the first time I’ve had a garden and I had NO idea of all the bulbs we had buried! I was so surprised and happy when the crocus appeared – and so sad when they froze! Then a load of different Hyacinth and tulips. Then hosta and peony! The little rose bush I planted that I thought was a goner came back too.My azaleas started blooming and the lilies are coming up! My sweet William is bursting with flowers! Even Some of the pansies and violas from last year came back! Finally just the other day I saw a tradescantia for the first time and had to look it up to see what it was. 🙂 which brought me to this page. I’m learning so much and loving it!